This issue of Focal Point focuses on the recognition that mental health and physical health should not be considered separately. It addresses how the mind and body impact each other, and how we can strive to achieve balance within ourselves. 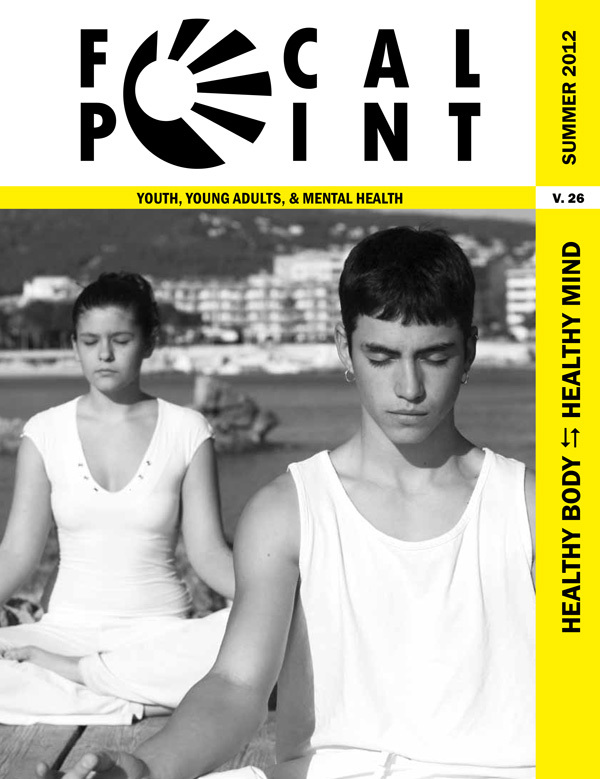 The editor ofFocal Point explains the interconnectedness of mental and physical health and describes how each article addresses attainment of balanced, holistic health. This article gives us a look into how yoga can be beneficial to those who have experienced trauma by regulating the emotions and helping one feel more comfortable in his or her body. This transformative story recounts a young woman’s descent into depression and self-harm, her struggles with institutionalized therapy, and the mentor that helped with her recovery. In this article, certain aspects of contemplative science and education are highlighted in the context of practicing mindfulness – or "living in the moment" – to manage the stress involved with transitioning from adolescence to adulthood. This article takes a look at how diet can affect our physical and mental health, what foods we should avoid, and what foods we should consume to promote better holistic health. This article addresses weight gain and related side effects that may occur while taking medications to manage schizophrenia, as well as the trade-offs of taking some medications as opposed to others. This article provides insight into one young adult’s struggle with weight gain caused by taking anti–psychotic medications. This article gives us a glimpse into the mindset of a gender non-conforming young adult, showing us through a first-person narrative the struggles of feeling comfortable in one’s own skin. Data Trends: Exercise to Treat Depression: How Much is Enough? This article reports on a study that investigated whether exercise can be considered a viable treatment for depression, and just how much exercise is needed for it to work. This article examines the effectiveness of relaxation massage therapy as a preventative treatment for stress, anxiety and aggression in young adult psychiatric inpatients.